I’d like to start by thanking you both for joining me today. Now the two of you have lunch with Miyamoto-san on a more or less daily basis. I sometimes join you, which means that we’ve spent a lot of time together. But this is the first time we've ever spoken in this kind of formal setting. 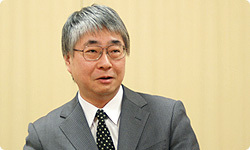 Especially for Tezuka-san, even though the Iwata Asks interviews have been going on for such a long time, this is the first time that you have formally participated, isn’t it? (laughs) Well, I asked you to join me for this interview because I felt that it was impossible to discuss the history of Mario without reference to the triangle formed by Miyamoto-san, Tezuka-san and Nakago-san. Perhaps we could start with the two of you briefly explaining what your roles are. I work as a producer in the Entertainment Analysis and Development Division, working alongside Shigeru Miyamoto-san in overseeing all aspects of game development. You’re the head of the Software Development Department. That’s right. My official position is General Manager of the Software Development Department in EAD. Actually, I was really pleased when you became the head of the department, as it was the first time a department was headed by someone younger than me. You’ve worked alongside Miyamoto-san ever since you first joined the company, haven’t you? So you joined the year after the Famicom1 was released. 1 The Famicom, known as the Nintendo Entertainment System outside Japan, was a home gaming console released in July 1983. I’m currently the President of SRD2. I originally came to Nintendo to assist with programming for the Famicom and ever since then I’ve been lucky enough to be involved in many of Nintendo’s products. 2 SRD CO., LTD. is a company that was founded in 1979 to programme video games and to develop and sell CAD (Computer-Aided Design) packages. The company is based in Osaka and its Kyoto office is located inside the Nintendo headquarters. So how were you originally introduced to Nintendo? The job I originally did at SRD had absolutely nothing to do with video game development. The kind of work I did included programming office calculation software for use on standard personal computers. You were working on applications such as control systems, meaning you were more on the business end of things. So how did you end up becoming involved in video game development? Well, the thing that got me involved with Nintendo was the 6502 chip3 that Ricoh had developed for the Famicom. 3 The 6502 chip leapt to prominence when it was used as the CPU in the Apple II home computer. The Famicom CPU was a specially-developed version of this chip. That was the Famicom’s CPU (Central Processing Unit), wasn’t it? Right. So at that time, Nintendo were looking for programmers who were familiar with the 6502. I was told that because Nintendo were developing a new chip, they wanted to develop new programmes in tandem with that and I became involved in working for the Famicom. So I started off dealing with Research and Development 2 (R&D2). 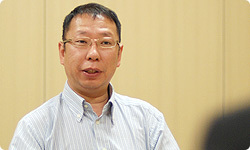 R&D2 would later be merged into the Software Planning and Development Division, but at that time they were the department responsible for developing both hardware and software for the Famicom and Super Famicom4. 4 The Super Famicom was the successor to the original Famicom games console and was released in Japan in November 1990. That's right. I worked on a wide variety of titles together with R&D2, including Donkey Kong5, which was released at the same time as the Famicom, Donkey Kong Jr.6, Mahjong7 and Donkey Kong Jr. Math8. 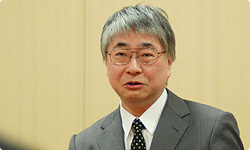 5 Donkey Kong was the first game designed by Shigeru Miyamoto. Released in the arcades in 1981, it appeared on the Famicom in 1983. 6 Donkey Kong Jr. was released in the arcades in 1982 and appeared on the Famicom in 1983. 7 Mahjong was released for the Famicom in August 1983. Mahjong is a Chinese tile-based game. 8 Donkey Kong Jr. Math was a fun educational game released in December 1983 for the Famicom. So your job was to port arcade games like Donkey Kong over to the Famicom? That’s right. Then around the time that job was coming to an end, someone I didn't know came up behind me and said: “You’re Nakago-san, right?” And that turned out to be Miyamoto-san. I honestly didn’t know anything about him! (laughs) At that time, I didn’t even know that anyone by the name of Miyamoto was working for the company. Then he came up to me and said: “We’re going to be working on Excitebike 9 together.” 9 Excitebike was a side-scrolling racing game released for the Famicom in November 1984. Excitebike? So how many years would that make it since you and Miyamoto-san began working together? It’s just over twenty years. It’s longer than that, isn’t it? Well, yes, it's around twenty-five years. 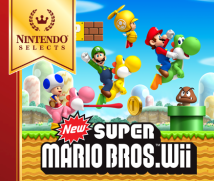 So immediately after working on Excitebike and Ice Climber 10, I was thrown right into the Super Mario Bros. and Zelda series. 10 Ice Climber was an action game released for the Famicom in January 1985. I’m going to ask you all about what happened after you were thrown into the Super Mario series in a moment. But casting my mind back, I believe I met you just prior to that. That’s right. What sticks in my mind in particular is the guidance you gave me at the time of Balloon Fight 11. 11 Balloon Fight was an action game released in the arcades in 1984. It appeared on the Famicom in January 1985. Ah yes. At that time, there was an arcade circuit board called the Nintendo Vs. System 12 that used the same chipset as the Famicom. 12 The Nintendo Vs. System was a circuit board for arcade machines that was developed to be compatible with the Famicom. A large number of titles, including Balloon Fight and Excitebike, were released in both Famicom and arcade versions. We worked on the arcade version. 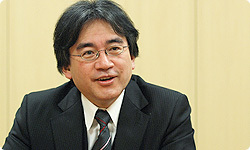 Then after we'd completed it, we wondered why the player's movements were smoother on the home version developed by HAL and asked Iwata-san for some advice. That’s when I told Nakago-san everything I knew. One thing I recommended was that instead of calculating the character’s position using integers, they should also calculate it using decimal points, thereby doubling the precision. In this way, calculating gravity, buoyancy, acceleration and deceleration all become more precise and the movements look smoother. That’s the kind of thing I explained at the time. I was actually really pleased to be asked. Well, I hoped it would prove useful, and I believe that it did when you came to work on Super Mario Bros. Yes, it proved incredibly useful. The reason why Mario moves so smoothly in the underwater stages is thanks to the guidance I was given by you. Out of interest, how old were you when we first met in 1984? At that time, I’d have been about twenty-six. Miyamoto-san is five years older than me, so he'd have been thirty-one. I was twenty-four at the time. How about you, Tezuka-san? Well, I was the new boy, aged twenty-three.